Jason Benzschawel has been involved with the plumbing business and visiting jobsites with his father Al since he was about five-years-old. Jason has learned many tricks of the trade from Al and is honored to carry on his father’s business. Jason obtained his Master Plumbing License in 2005 and took over the plumbing business in 2007. He is a hands-on business owner and is in the field on a daily basis. Jason continues to master his trade through numerous training opportunities, trade shows and is the one of the only registered service technician for tankless water heaters in the greater Green Bay area. Jason grew up in a time and place where a handshake meant more than a simple greeting and he continues to run his business in that same matter. Hardworking, genuine and self-driven are a few of the words that are often associated with Jason’s name and he also instills those same traits upon his employees. 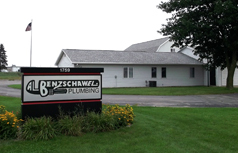 Jason’s wife, Kelly, is also an active part of Benzschawel Plumbing. After a 15 year career as a music teacher in the GRACE School System, Kelly has decided to take a more active role in the plumbing business. When she is not volunteering in their children’s classrooms she can be found in the showroom/office and is ready to help you with your plumbing needs.